What follows is the post I wrote a week ago, on Sunday, my day for letting my spirit go where it wills. I was feeling very calm but curious about the future. The post was basically a response to contacts about the e-mail on food. Many readers wanted more input from me on the points that fired their synapses. I will try to oblige, but I do want to take a few risks so that we have a solid foundation for connecting the dots, sorry about that tiresome reference, but I think it is somehow helping many people to recognize when and why their synapses fire. We all build our frames of reference in highly individualistic and idiosyncratic ways. When I relate an incident from my past, the purpose is not to be personal but rather to show how the thought arose since experience is ultimately our best teacher. This accomplishes two goals: (1) it gives you the chance to accept or reject my thoughts based on the relevance of the origin of the thoughts, and (2) it encourages you to give credence to your own experiences, even those that fall outside the box and for which there is no common agreement among others. I also hope it helps people to understand each other better and to respect differences of opinion. That said, there is probably room for weighing the merits of each point of view so we also have to find the balance between tolerance and what is preferable. In a recent post, I alluded to the possibility that the secret of successful breatharianism is to be more like plants. That was obviously intended to be a tad facetious, but there have been some breatharians who seem to be remarkably healthy. This, of course, challenges all we think we know about the need to eat. I actually favor this choice even though, on some level, it does not seem to be practical. Obviously, it is not simply humans who eat, but just about every species probably depends on something further down the food chain to survive. Even plants do not live by photosynthesis alone since they depend on water and nutrients in the soil. They appear to be sentient, to have families, likes and dislikes, and even fears. I believe the work of the late Cleve Backster proved this. His story is not just interesting, but compelling given that his day job was as an intelligence specialist with the CIA. Lots of individuals have investigated plants and shown that they have musical preferences, that when attaching electrodes, they will control the climatic conditions of greenhouses by opening and closing windows, activating sprinkler systems, and, it seems, change the music being piped into their homes, for the greenhouses are their homes. Suzanne Simard has demonstrated that plants do not simply have families but they pass materials to their progeny when there are crises, such as tree harvesting, forest fires, draughts, and other dangerous situations. The point here is that we are all interconnected in highly complex ways that imply mutual responsibilities and the need for respect and long-term trusteeship. This being the case, when I talk about growing some of your own food, there are health factors to consider as well as commitments to the plants, many of which are suffering from toxins in the soil, water, and air. As a civilization, we are doing an exceptionally poor job of Earth stewardship. History suggests that biodiversity is what has allowed us to recover from blights and droughts and other crises in the past, but we never had so many unnatural factors to address in the past. We did not use stockpiles of weapons as fertilizers, did not rain nuclear materials and chemtrails on vast swaths of land, and did not genetically alter the plants. Sure, we grafted here and there and created hybrids, but the scale has changed as has the destruction of pollinators. This is why I have spent years now talking about seva, the service we can render bees and butterflies, the seed banking and seed sharing that is vital to diversity, and the composting of kitchen and yard waste so as to build up the quality of the soil where we grow our food. The capacity for each person to contribute depends a great deal on the living situation and commitment. Some people live in urban apartments and perhaps have only a windowsill where they could potentially grow something. Others are unemployed or retired and could energize whole neighborhoods and communities to become more proactive. There are places where food is being grown along roadsides. It seems like a good idea, but I suspect the plants are exposed to a lot of car exhaust and perhaps also pesticides. Since I have cautiously supported POTUS where the swamp is concerned, I feel I should explain that I vote Green so even though I want children to be safe from human traffickers, I also want the environment to be safe for future generations. This is why I found Ecuador attractive. It has, as I have often reminded people, given constitutional protection to the environment. We have alphabet agencies run by socially irresponsible appointees who usually have corporate backgrounds. Creating jobs is only worth celebrating if the jobs will make the world a better place. So, if, for example, I generally favor the revitalization of the electric car, I am the first to acknowledge that there are even cleaner ways to run cars than using huge batteries. 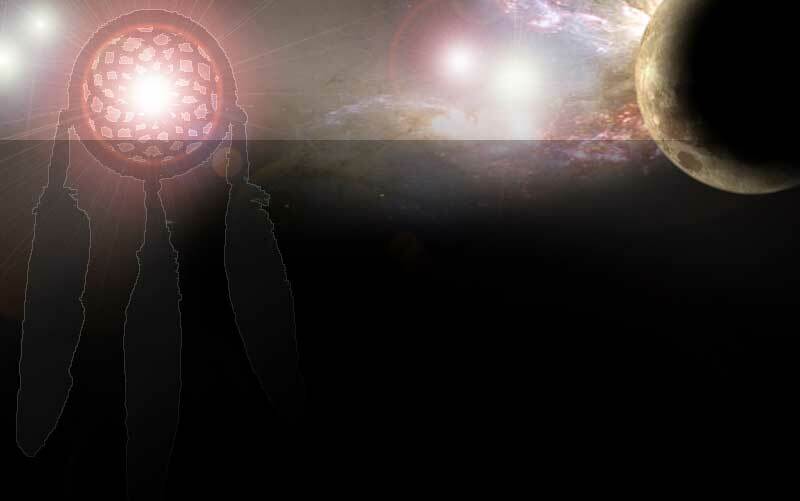 Likewise, I favor global demilitarization and redirection of planetary resources to sustainability and away from exploitation and toxic practices. So, these statements establish the context for discussing what individuals can do. I will try to scale this a bit, reminding everyone of the famous Chinese adage that even the journey of 10,000 li begins with a first step. Most plants are grown from seeds, seeds that sprout. On landscapingrevolution.com, I listed over a hundred different seeds that people can sprout indoors. The usual introductory projects involve lentils and/or mung beans and sometimes various salad greens or vegetables like radishes, broccoli, and peas. However, one can sprout sunflower seeds, nuts, and dozens of other options. 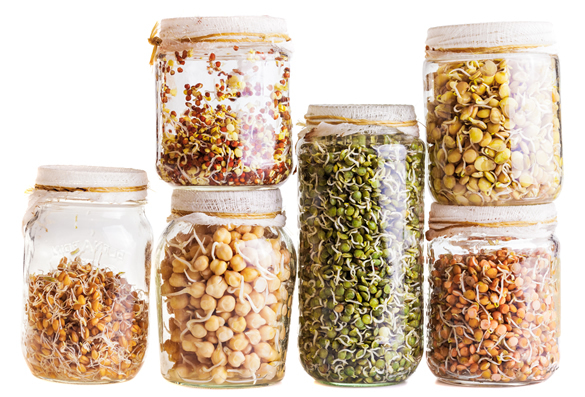 Sprouting jars and trays have small footprints, the size of a mason jar or tray. 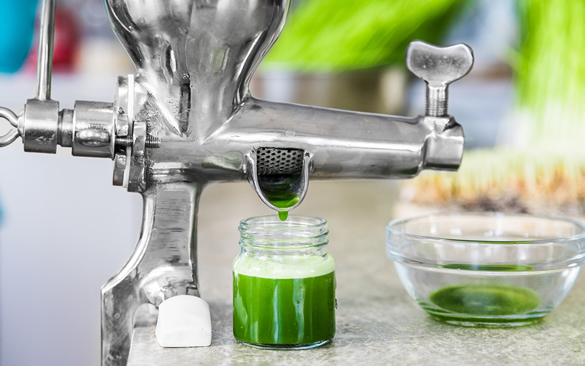 Wheatgrass is a slightly different proposition but one people might consider, especially those with cancer. Keep in mind that chlorophyll is very beneficial for building healthy blood, and sprouts are nutrient dense and have a quick turnaround time. I have never worried about starving because I know I can produce enough to feed myself and my birds just by sprouting. In a pinch, I could also dig up some roots and really have a feast. After World War II, some members of the Swedish ski troops were found. Cut off from supply lines and contact with the world, they survived the winter on pine needles. Their health was compared to those who lived on rations, largely canned food, and they were found to be lower in weight but otherwise significantly healthier than their counterparts in other branches of the service. Mother Nature is very kind and generous, but we need to understand Her better. 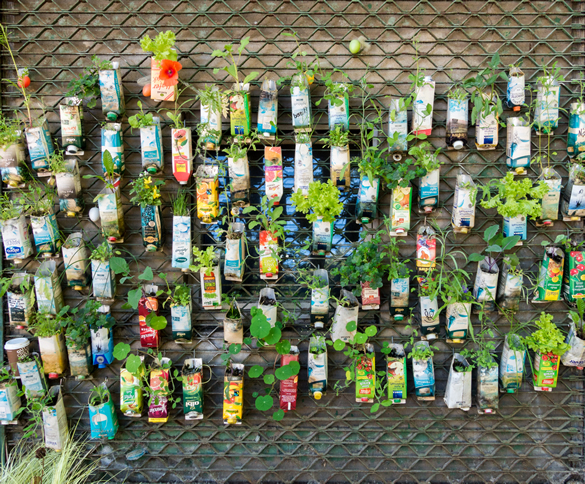 There are a number of different ways to garden with soil in very tiny places, everything from window sills, walls, to planters on balconies and patios. The critical difference between sprouting and window gardening is the use of soil. When space is limited, one can have multiple levels for plants, like ladders or shelves. In general, growth will be better when the windows face south as this helps to capture more of the winter sun. In some climates, shades may sometimes be necessary. Below is a plant wall in Berlin. Hanging baskets are another indoor possibility. 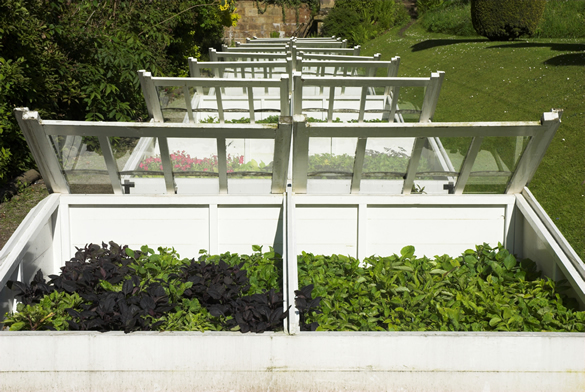 Several salad baskets may be enough to provide fresh greens year round. These can hang from the ceiling and use either window light or artificial light such as grow bulbs. Many people have small planter boxes on their balconies. A surprising amount can be grown in these boxes and a few boxes may be efficient enough to produce a significant portion of one's needs. These can be placed at ground level or on raised platforms that make gardening easier for those with handicaps or infirmities. Roof gardening is, of course, another possibility and one that is becoming increasingly popular in urban areas and tourist destinations. 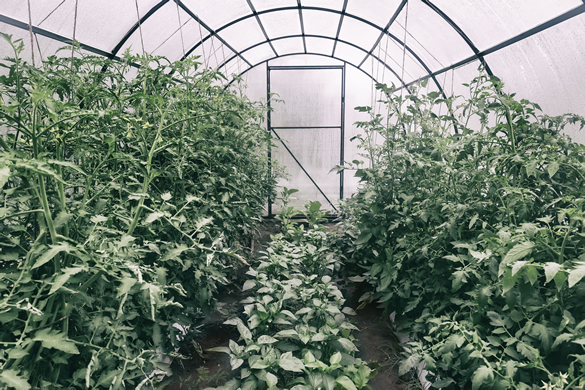 Many people are now growing food throughout the year using cold frames and greenhouses that are heated by everything from solar panels to rocket stoves. Others are using the budget gentle hoop growing tunnels. These consist of covered beds using bamboo, wire, rebar, or PVC piping to support a covering, usually polyvinyl sheeting but sometimes polycarbonate or UV protective materials. For less than $200, one can actually convert a lot of garden to winter-friendly and perhaps even chemtrail-resistant home farming. Every time I get sufficiently curious to find out what people are doing, I see that fabulous minds are working on solutions that lower the cost of living and improve the quality of life, nice combination. Sometimes, I am a little wary. For instance, some people are recycling plastics and this may be good in some ways but it cannot really improve our food quality. Plastics are basically petrochemical products that can be converted back to oil. They are usually estrogenic and it is hard not to speculate that some gender confusion may be caused by various chemicals that affect our endocrine glands. Recent disclosures suggest that the unisex goal has been part of the hidden agenda for several decades, but it is now reinforced by politically correct language and new legal definitions. I am all for allowing people to run their own lives without any interference so long as their actions do not harm anyone. I do not see a religious or moral issue here. I see a chemical and psychological situation that could conceivably reverse if we cleaned up our air, water, soil, food, and medicine. To the extent that this would require strong political action, the implication is that if the policies changed, people would change. Of course, if people change, they would force changes in corporate and governmental behavior. That said, there is a lot of stress from exogenous sources so making changes on even a small scale is at least a step in the right direction. We are organic beings with very specific requirements. We were not designed to consume synthetic substances much less to be chipped and run by technocrats. We were intended to be natural, not refashioned by pseudosciences. Okay, it is time to post this. I confess I have had an early case of spring fever and various ideas have been circling my tiny brain. I need to make the move so that I can implement the ideas. In the meantime, I feel that whatever I do would have short-term benefits for Jinzu and me but more benefit for the next person to live in this house. Kitzia and I had a post-eclipse talk earlier today. I would say we are both on fire. She is having card reader problems and has not been able to send pictures of the planting she has done. By the time she gets that sorted out, some of the babies may be big. She has been drinking kalanchoe juice, one of the plant profiles I was about to upload when I temporarily lost my files. I really hope these computer issues are not contagious, but they seem to be! In any event, Kitzia's creative imagination is currently focused on healing recipes and mine are in alignment, almost ready to roll with Kitchen Doctor.